At this month’s master class, Janet is putting herself out of business. When it comes to accounting, most people want to handle it themselves. Then, they download Quickbooks and it’s so damn confusing. The tax language looks like mumbo jumbo and they’re worried about screwing up and losing money – so they pay a bookkeeper or CPA to do simple bookkeeping tasks they can do themselves. Janet has compiled the most common tax mistakes and questions and is teaching you the pain-free way to become your own bookkeeper. We’re gonna start from scratch and teach you the right way to organize your books and taxes, which makes tax time easy as pie. Why have taxes been so complicated in the past? Because you’ve been doing it the wrong way! Once you’re organized from the get go, your bookkeeping will run like clockwork. 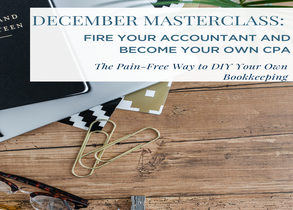 DIY bookkeeping – how to set up your books the right way, without needing to hire a professional on a monthly basis. What does the balance in undeposited funds mean (hint: if you have this, there’s a problem). You’ll walk away ready to organize your books for 2019!